Can combine to form a Beam Naginata. In U.C. 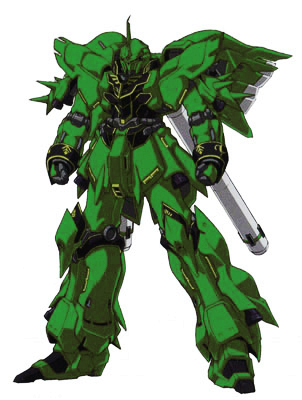 0094, two of the Sinanju Steins were stolen (disguised as transfers) by the remnants of Neo Zeon, "The Sleeves", slightly modified and used one as the personal machine of their leader. It was thus painted red and reminds many of the name 'The Red Comet'. However, the second unit was modified in the same manner, but painted green and is used by a Commander within the Sleeve's forces. This second unit was designated as MSN-06S-002 in order to differentiate between the two units.